Sura 37, The Arrangers (Al-Sãffãt) Quran The Final Testament, translated by Rashad Khalifa, Ph.D.
[37:1] The arrangers in columns. [37:2] The blamers of those to be blamed.  [37:3] The reciters of the messages. [37:4] Your god is only one. [37:7] We guarded it from every evil devil. [37:8] They cannot spy on the High Society; they get bombarded from every side. [37:9] They have been condemned; they have incurred an eternal retribution. [37:10] If any of them ventures to charge the outer limits, he gets struck with a fierce projectile. [37:11] Ask them, "Are they more difficult to create, or the other creations?" We created them from wet mud. [37:12] While you are awed, they mock. [37:13] When reminded, they take no heed. [37:14] When they see proof, they ridicule it. [37:15] They say, "This is obviously magic! [37:16] "After we die and become dust and bones, do we get resurrected? [37:17] "Even our ancient ancestors?" [37:18] Say, "Yes, you will be forcibly summoned." [37:19] All it takes is one nudge, whereupon they (stand up) looking. [37:20] They will say, "Woe to us; this is the Day of Judgment." [37:21] This is the day of decision that you used to disbelieve in. [37:23] beside GOD, and guide them to the path of Hell. [37:25] "Why do you not help one another?" [37:26] They will be, on that day, totally submitting. [37:27] They will come to each other, questioning and blaming one another. [37:28] They will say (to their leaders), "You used to come to us from the right side." [37:29] They will respond, "It is you who were not believers. [37:30] "We never had any power over you; it is you who were wicked. [37:31] "We justly incurred our Lord's judgment; now we have to suffer. [37:32] "We misled you, only because we were astray." [37:33] Thus, together they will all partake of the retribution on that day. [37:34] This is how we requite the guilty. [37:35] When they were told, "Laa Elaaha Ella Allah [There is no other god beside GOD]," they turned arrogant. [37:36] They said, "Shall we leave our gods for the sake of a crazy poet?" [37:37] In fact, he has brought the truth, and has confirmed the messengers. [37:38] Most assuredly, you will taste the most painful retribution. [37:39] You are requited only for what you have done. [37:40] Only GOD's servants who are absolutely devoted to Him alone (will be saved). [37:41] They have deserved provisions that are reserved specifically for them. [37:42] All kinds of fruits. They will be honored. [37:43] In the gardens of bliss. [37:44] On furnishings close to one another. [37:45] Cups of pure drinks will be offered to them. [37:46] Clear and delicious for the drinkers. [37:47] Never polluted, and never exhausted. [37:48] With them will be wonderful companions. [37:49] Protected like fragile eggs. [37:50] They will come to each other, and confer with one another. [37:51] One of them will say, "I used to have a friend. [37:52] "He used to mock: `Do you believe all this? [37:53] " `After we die and turn into dust and bones, do we get called to account?' "
[37:54] He will say, "Just take a look!" [37:56] He (will go to him and) say, "By GOD, you almost ruined me. [37:57] "If it were not for my Lord's blessing, I would have been with you now. [37:59] "only the first death, and we never receive any requital?" [37:60] Such is the greatest triumph. [37:61] This is what every worker should work for. [37:62] Is this a better destiny, or the tree of bitterness? [37:63] We have rendered it a punishment for the transgressors. [37:64] It is a tree that grows in the heart of Hell. [37:65] Its flowers look like the devils' heads. [37:66] They will eat from it until their bellies are filled up. [37:67] Then they will top it with a hellish drink. [37:68] Then they will return to Hell. [37:69] They found their parents astray. [37:70] And they blindly followed in their footsteps. [37:71] Most of the previous generations have strayed in the same manner. [37:72] We have sent to them warners. [37:73] Note the consequences for those who have been warned. [37:74] Only GOD's servants who are absolutely devoted to Him alone (are saved). [37:75] Thus, Noah called upon us, and we were the best responders. [37:76] We saved him and his family from the great disaster. [37:77] We made his companions the survivors. [37:78] And we preserved his history for subsequent generations. [37:79] Peace be upon Noah among the peoples. [37:80] We thus reward the righteous. [37:81] He is one of our believing servants. [37:82] We drowned all the others. [37:83] Among his followers was Abraham. [37:84] He came to his Lord wholeheartedly. [37:85] He said to his father and his people, "What are you worshiping? [37:86] "Is it these fabricated gods, instead of GOD, that you want? [37:87] "What do you think of the Lord of the universe?" [37:88] He looked carefully at the stars. [37:89] Then he gave up and said, "I am tired of this!" [37:90] They turned away from him. [37:91] He then turned on their idols, saying, "Would you like to eat? [37:92] "Why do you not speak?" [37:93] He then destroyed them. [37:94] They went to him in a great rage. [37:95] He said, "How can you worship what you carve? [37:96] "When GOD has created you, and everything you make!" [37:97] They said, "Let us build a great fire, and throw him into it." [37:98] They schemed against him, but we made them the losers. [37:99] He said, "I am going to my Lord; He will guide me." [37:100] "My Lord, grant me righteous children." [37:101] We gave him good news of a good child. [37:102] When he grew enough to work with him, he said, "My son, I see in a dream that I am sacrificing you. What do you think?" He said, "O my father, do what you are commanded to do. You will find me, GOD willing, patient." [37:103] They both submitted, and he put his forehead down (to sacrifice him). [37:104] We called him: "O Abraham. [37:105] "You have believed the dream." We thus reward the righteous. [37:106] That was an exacting test indeed. [37:107] We ransomed (Ismail) by substituting an animal sacrifice. [37:108] And we preserved his history for subsequent generations. [37:109] Peace be upon Abraham. [37:110] We thus reward the righteous. [37:111] He is one of our believing servants. [37:112] Then we gave him the good news about the birth of Isaac, to be one of the righteous prophets. [37:113] We blessed him and Isaac. Among their descendants, some are righteous, and some are wicked transgressors. [37:114] We also blessed Moses and Aaron. [37:115] We delivered them and their people from the great disaster. [37:116] We supported them, until they became the winners. [37:117] We gave both of them the profound scripture. [37:118] We guided them in the right path. [37:119] We preserved their history for subsequent generations. [37:120] Peace be upon Moses and Aaron. [37:121] We thus reward the righteous. [37:122] Both of them were among our righteous servants. [37:123] Elias was one of the messengers. [37:124] He said to his people, "Would you not work righteousness? [37:125] "Do you worship a statue, instead of the Supreme Creator? [37:126] "GOD; your Lord, and the Lord of your forefathers!" [37:127] They disbelieved him. Consequently, they had to be called to account. [37:128] Only GOD's servants who are absolutely devoted to Him alone (are saved). [37:129] We preserved his history for subsequent generations. [37:130] Peace be upon Elias, and all those like Elias. [37:131] We thus reward the righteous. [37:132] He was one of our believing servants. [37:133] Lot was one of the messengers. [37:134] We saved him and all his family. [37:135] Only the old woman was doomed. [37:136] We annihilated all the others. [37:137] You still pass by their ruins by day. [37:138] And by night. Would you understand? [37:139] Jonah was one of the messengers. [37:140] He escaped to the loaded ship. [37:141] He rebelled and thus, he joined the losers. [37:142] Consequently, the fish swallowed him, and he was the one to blame. [37:144] he would have stayed in its belly until the Day of Resurrection. [37:145] We had him thrown up into the desert, exhausted. [37:146] We had a tree of edible fruit grown for him. [37:147] Then we sent him to a hundred thousand,* or more. [37:148] They did believe, and we let them enjoy this life. [37:149] Ask them if your Lord have daughters, while they have sons! [37:150] Did we create the angels to be females? Did they witness that? [37:152] "GOD has begotten a son." Indeed, they are liars. [37:153] Did He choose the girls over the boys? [37:154] What is wrong with your logic? [37:155] Why do you not take heed? [37:156] Do you have any proof? [37:157] Show us your book, if you are truthful. [37:158] They even invented a special relationship between Him and the jinns. The jinns themselves know that they are subservient. [37:159] GOD be glorified; far above their claims. [37:160] Only GOD's servants who are devoted to Him alone (are saved). [37:161] Indeed, you and what you worship. [37:162] Cannot impose anything on Him. [37:163] Only you will burn in Hell. [37:164] Each one of us has a specific job. [37:165] We are the arrangers. [37:166] We have duly glorified (our Lord). [37:169] "we would have been worshipers; devoted to GOD alone." [37:170] But they disbelieved, and they will surely find out. [37:171] Our decision is already decreed for our servants the messengers. [37:172] They are surely the victors. [37:173] Our soldiers are the winners. [37:174] So disregard them for awhile. [37:175] Watch them; they too will watch. [37:176] Do they challenge our retribution? [37:177] When it hits them one day, it will be a miserable day; they have been sufficiently warned. [37:178] Disregard them for awhile. [37:179] Watch them; they too will watch. [37:180] Glory be to your Lord, the great Lord; far above their claims. [37:181] Peace be upon the messengers. [37:182] Praise be to GOD, Lord of the universe.